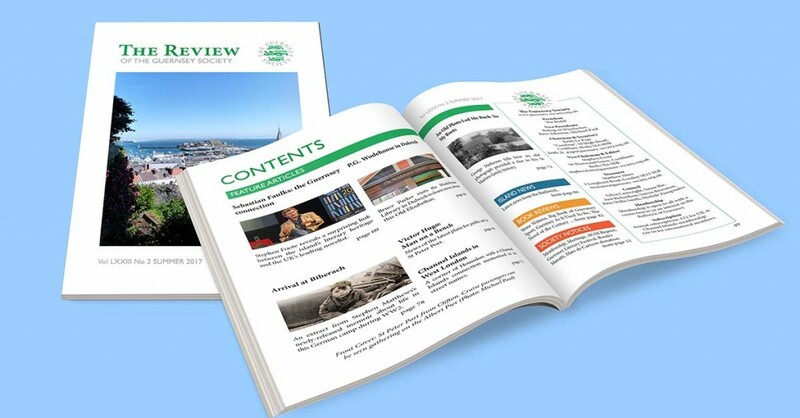 The Summer edition of The Review will be in the post next week. This edition has a distinct literary theme. We have a report on our May presence at the Guernsey Literary Festival, details of an obscure literary connection between Sebastian Faulks, Elizabeth Goudge and Victor Hugo, Bruce Parker’s account of the P.G. Wodehouse Library that has been established at Dulwich College and news of efforts being made in Guernsey to establish a Victor Hugo bench. For those less interested in literary matters, there is news of our sporting triumph over the Jersey Society at the recent Boules Muratti, a report on our Annual General Meeting, an article from Canadian member, George Matheson about his quest for his family’s Guernsey origins, an excerpt from Stephen Matthews’s gripping memoir of his childhood experience as an inmate of Biberach. Reviews of recent local books include Guernsey As It Used To Be by George W.J.L. Hugo, Stone Witness, an eclectic collection of poetry from Guernsey poet Richard Fleming, David Bellos’s case for Les Misérables to be considered The Novel of the Century and Rob Batiste’s Big Book of Guernsey Sport. In addition, we have the usual summary of Island News, and details of forthcoming Society meetings in London and Guernsey. The Review is sent out free to members three times a year.